Carnevale is one of the most interesting and funnny feast in Ital! It is also called Carnival or mardi gras and it has always been celebrated in Italy and in many places around the world exactly 40 days before Easter. Carnevale in Italy is a huge winter festival full of parades, music, masquerade balls and parties. Children and adults throw coriandoli at each other. A Carnevale ogni scherzo vale, anything goes at carnival and so pranks are famous during Carnevale. 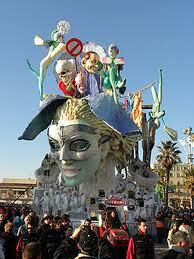 Carnevale developed from pagan roots and it has been adapted to fit into the Catholic church. Carnival is actually one date, but in Venice and some other places in Italy the celebrations and parties take off a couple weeks before!! The Maschere are the most important part of the carnevale: Venice is the best place to show and see traditional carnival masks and people also dress up with the help of fantastic costumes for the festival. Viareggio is another place really funny to be in this periods! The most famous and elaborate “carri” are born and developed here, inside the artisan’s laboratories, which work all year round to get to this particular day and show off their incredible creations: the “carri” present parody of the main politician events, with cartapesta characters. Guess who is the most represented Italian politician this year? Ok, let’s help you a bit…it start with “b” the name. But Mr. B. is not the only one of course: the masquerade parade involves a lot of characters and topics all to taste and experience goign to Viareggio in this period. What may you eat during Carnevale? Each region and even each city and town has its own tradition, but fairly common is the chiacchiera, a kind of really fragile and tasty pastry based dessert!! The 2011 date for Carnevale? It is March 8th but many celebrations in Venice and many parts of Italy startalready in February. This entry was posted on Monday, November 28th, 2011 at 5:29 pm	and is filed under Events in Italy. You can follow any responses to this entry through the RSS 2.0 feed. You can leave a response, or trackback from your own site.